Saildrones will attempt to track and study the behavior of chinstrap penguins tagged with GPS locators during the 2019 Antarctic Circumnavigation mission. The chinstrap penguin is one of 17 species of penguins, all of which live in the Southern Hemisphere. While many species of penguin are threatened or endangered, the global population of chinstrap penguins is estimated at over eight million. Chinstraps feed primarily on Antarctic krill, squid, and small fish like sardines and anchovy, but recent changes in hunting behavior could suggest changes in the greater Antarctic ecosystem. Chinstrap penguins are easily recognizable for the black line that runs under their chin from ear to ear. They stand two to three feet tall, and adults weigh about 10 pounds. On land, they prefer tobogganing to waddling; they are often spotted diving across the snow propelling themselves forward with their feet and flippers. They live and breed primarily in Antarctica, as well as on several islands in the South Atlantic Ocean, New Zealand’s Balleny Islands, and South America. Penguins spend up to 75% of their life in the water, and they’re powerful swimmers, sometimes covering 50 miles round trip in a single day. Chinstrap penguins have been clocked torpedoing through the water at up to 20 miles per hour—compare that to 23-time Olympic gold medal-winning swimmer Michael Phelps who tops out at a modest six miles per hour! Chinstraps are also efficient divers; in less than a minute, they can dive 200 feet below the ocean’s surface. When penguins head out to sea to hunt for food, it’s called foraging. Scientists believe there is a relationship between changes in the coastal weather and the foraging behavior of chinstrap penguins that could help us understand more about the overall health of the Antarctic ecosystem. 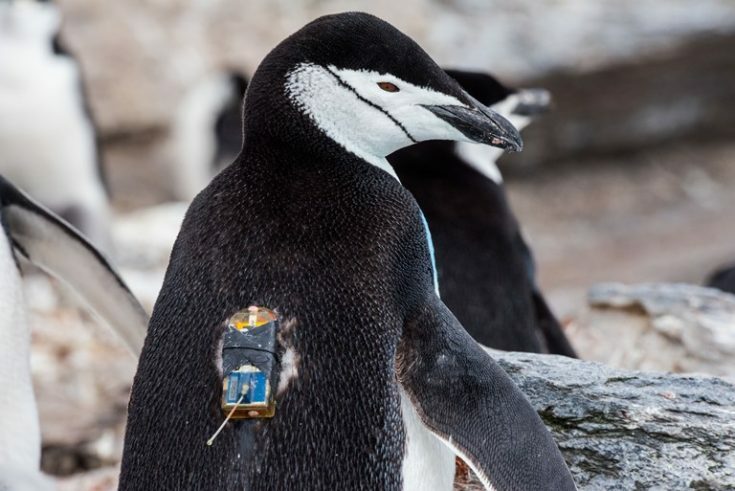 NOAA researchers have tagged several penguins with a small GPS device attached to the birds’ feathers to record the depth and location of their dives. Penguins have been tracked from their breeding colonies on Powell Island, on the Antarctic Peninsula, making fewer, longer foraging trips. This new behavior could suggest that climate changes have reduced the availability of krill near the coast. The drawback to previous tagging efforts is that the penguins have to be recaptured for the tag to be removed and the data downloaded. During the Saildrone Antarctic Circumnavigation mission, saildrones will measure prey in the areas where penguins forage using an echo sounder. This type of up-close study is possible only because of the innovative design of the saildrone. Powered entirely by wind and solar, saildrones are completely silent and will not disrupt the penguins’ natural habitat. Saildrones have previously been used in the Arctic tracking tagged seals. Researchers hope to understand more about how changes in the Antarctic water temperature and size, abundance, and distribution of krill and fish affect the movement of chinstrap penguins. “Penguins are an ideal animal for assessing the status of the Antarctic ecosystem. They’re approachable, return to predictable areas every year, and are large enough to carry an array of instruments that give us a direct window into their world,” explained NOAA seabird research leader Dr. Jefferson Hinke. Despite how remote Antarctica is, the healthy function of the region is critical to global planet health. The Antarctica ecosystem could be threatened by climate change and commercial fishing activity. Understanding more about the Antarctic food web and how different aspects of the ecosystem are interlinked is critical to making responsible and sustainable decisions about the future of the region and beyond. Follow the Saildrone Antarctic Circumnavigation and Education Outreach Project at saildrone.com/antarctica.